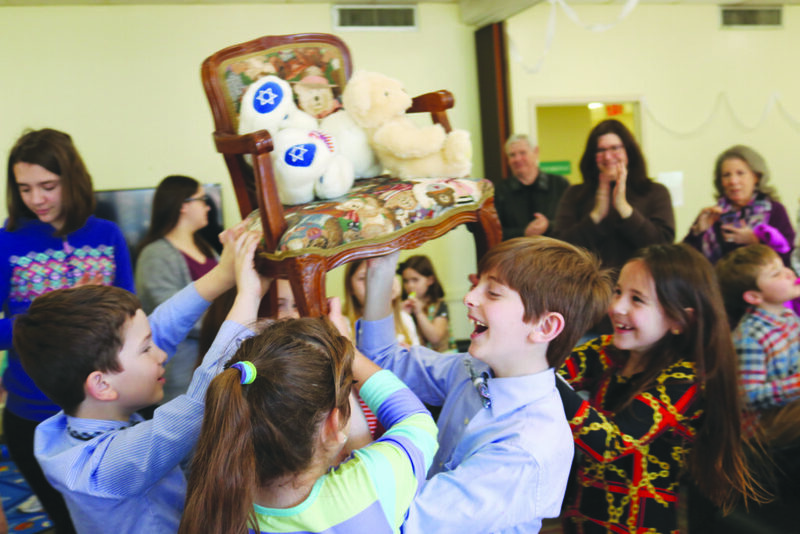 Gabe Strauss, Jori Kohleriter, Drew Galardi, Layla Lazurus enjoy the chair dance with their Teddy Bear bride and groom. The wedding party and Rabbi Ariel Boxman were joined in the sanctuary by religious-school students, friends and family. The bridesmaid and bride walked down the aisle to music played by the Temple Shalom Kazoo Band, The Relative Minors. The wedding party chose seven original blessings for the wedding bears, and after a symbolic exchange of rings, apple juice, vows and the breaking of the glass, the bears were officially married. At the reception, the bride and groom entered into a room filled with bubbles. Festivities included the traditional chair dance, hora and bottle dance. The Relative Minors performed their favorite melodies including, of course, the top of the song chart, “Baby Shark” (with original verses of Rabbi Shark, Bride Shark and Groom Shark). The highlight of the reception was when students and parents decorated their own cupcakes.